Point Spreads: Sportsbooks assign a point spread or line to each matchup. A point spread equalizes two unequal competitors. Sportsbooks handicap favorites by giving points to the underdog. This gives the bettor a margin of error. Point spreads with standard juice cost $110 to win $100. Other juice values can be found next to the line. Overtime results count towards the final result. Totals: Sportsbooks assign a total to each matchup. A total estimates the sum of points both teams will score. Bettors choose whether the final result will be over or under the sportsbook’s number. Total bets with standard juice cost $110 to win $100. Other juice values can be found next to the line. Overtime results count towards the final result. Share this infographic with your buddies. It makes NFL odds easy to understand. Let’s break each line into steps to understand the numbers. 09/01 is the game date. 1:00 PM is the game time. You must bet before game time! NYC and LA are the teams. 100 is NYC’s rotation number. 101 is LA’s rotation number. These numbers are used interchangeably at sports books. You could ask for a $200 bet on 100, meaning NYC. Or a $200 bet on 101, meaning LA. Step 2: What’s the spread? -6½ means NYC is the 6½ point favorite at Book 1. LA is the +6½ point underdog. 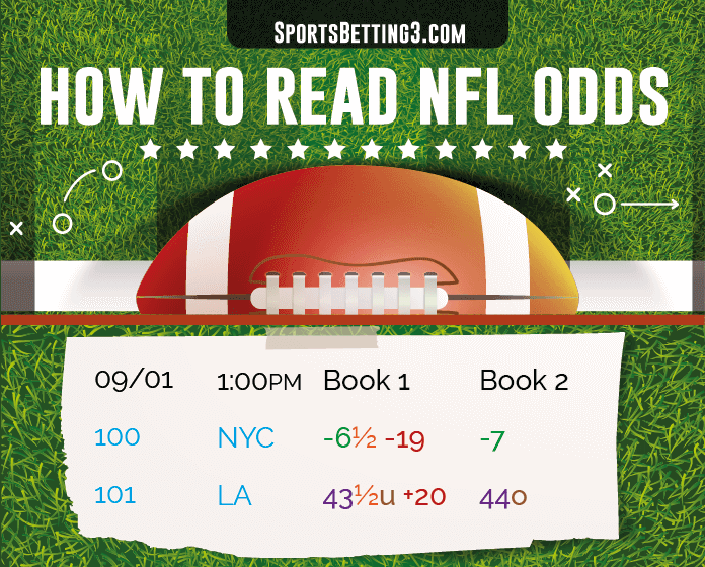 -7 means NYC is the 7 point favorite at Book 2, LA is the +7 point underdog. Step 3: Why ½ Points? ½ point means no tie bets. 6½ rounds up to 7. Therefore, NYC must win by 7 or more at Book 1. NYC must win by 8 or more at Book 2. A 7 point win ties the spread. Tie bets are returned. Oddsmakers use ½ points strategically to avoid pushing players. This ensures the bet either wins or loses. ½ point spreads are commonly offered for the Super Bowl, because it is the last game of the season. Bookies would rather not return Super Bowl bets because players will have no further football bets to make. Step 4: What’s the total? The total is the greater of each book’s numbers. “u” means Under, “o” means Over. Book 1 predicts a 43½ point total. Book 2 predicts a 44 point total. ½ point total means no ties just like ½ point spreads. Tie total bets are returned. Sports books will provide odds for both sides of a line. See each website. Third party tables only show the most expensive bet. Steps for manually calculating opposite side are provided at bottom of page. Numbers to right of spread and total indicate sportsbook juice. Also called vigorish or vig. It’s the fee charged for a bet. Put 1 before any two digit number. -19 becomes -119. -40 becomes -140. Negative numbers indicate how much risk to win $100. Positive numbers indicate reward for risking $100. +120 means win $120 for risking $100. Betting NYC -6½. You risk $119 to win $100 at Book 1. -119 NYC juice corresponds to -101 LA +6½. Betting LA +6½. You risk $101 to win $100 at Book 1. Book 2’s spread juice isn’t provided. Assume -110 or a “dime line”. Lay $110 to win $100. Betting the under -140 at Book 1. You risk $140 to win $100. -140 under juice corresponds to +120 over at Book 1. Betting the over +120 at Book 1. Win $120 for risking $100. Book 2’s total juice isn’t provided. Assume -110 or a “dime line”. Lay $110 to win $100. Given two equal point spreads or totals, take the Book with less juice. A lower commission means you won’t have to risk as much to bet on the favorite. Also shop positive juice numbers. Under 35 +118 at one book is less profitable than +120 at another. You’ll get an extra $2 reward for making this bet at the other book!